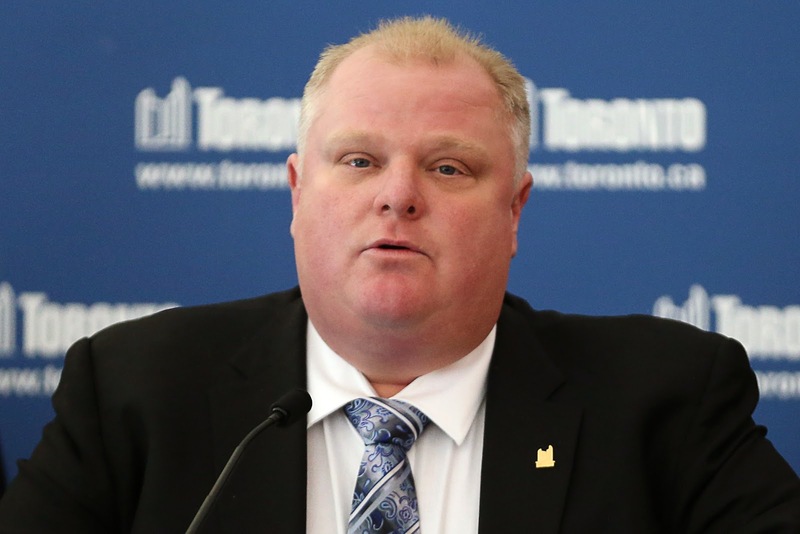 Now Toronto Mayor Rob Ford has stomach cancer and has withdrawn from the mayoralty campaign. His brother Doug will run for mayor in his place, but like his brother, seems unlikely to win. Rob Ford announced he is running for his previous seat on council. At least in theory. Right now, his cancer is the defining issue for him and his family. Ford is now receiving chemotherapy to treat his particularly virulent form of the disease. He will undergo two bouts of chemo and each will last three days. After each, there will be 18 days of recovery. He will emerge from this treatment on October 30. The election is October 27. Whether he will be in any shape to take his seat as city councillor (there is no doubt that he will win), is another question. Assuming that Rob Ford's political career has ended at least for now, it's worth looking at the legacy of the Ford years. Even before he was elected as Mayor, Rob Ford, as a sitting councillor for the previous ten years, was an affront to right-thinking Torontonians. His public displays of drunkenness, drug use and bully tactics may have offended the elites. For many suburbanites, that mattered less. His instinct for retail politics played well. He never met a pothole he didn't want to fix. Even with a tenuous understanding of what constitutes a conflict-of-interest, his frequent displays of mis-behaviour garnered quiet approval simply because he so easily offended the FOOFs (Fine Old Ontario Families) and the media that back them up. More to the point, he didn't give a damn who condemned him. As mayor, Rob Ford accomplished very little. He was only one vote among 40 + councillors. His objections to various bills were regularly ignored. He claimed to have halted reckless spending, but not so anyone noticed. He said he kept taxes low, but in fact they rose while he was mayor. What Rob Ford accomplished over the past four years, more than anything, was to demonstrate that Toronto's thin veneer of inclusiveness and diversity was not much more than an urban myth, perpetuated by the same downtown elites that used to run Toronto until Ford became mayor. Toronto is a city whose race and class divisions are now more exposed than ever before. And Rob Ford is responsible for that. Ford in his coarse and vulgar way, flipped the bird at the old WASP establishment (to which, it must be said, he is somewhat connected), and working class suburbanites love him for that. They may tut-tut his "drunken stupors" as he himself described them, but they were prepared to overlook them as long as he was able to "épater les bourgeois." And did he ever épater them. Those class and racial division suddenly occurred to me: A few weeks ago, I was walking along Bloor Street West at Spadina Avenue, on the edge of the tony Annex and the downtown campus of the University of Toronto. At that corner, there are three Heritage Plaques placed by the City of Toronto. They commemorate historical events around the city. 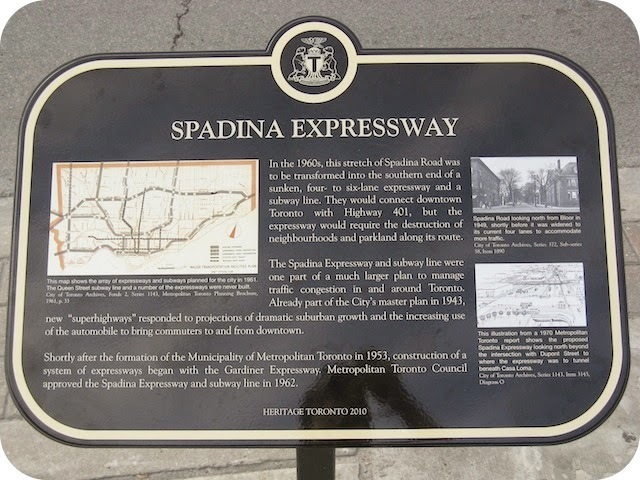 These plaques commemorate when a tunnel called the Spadina Expressway was stopped by a concerted effort of locals and environmentalists. The Expressway would have connected the suburb of North York with downtown Toronto. It would have brought a lot more traffic to the city and it would have massively disrupted life for residents of the Annex with its artists, intellectuals and professorial classes. The great New York urbanist Jane Jacobs had moved to Toronto and she was instrumental in stopping the project in 1971. Downtowners were thrilled and still point to this event as a highpoint in urban integrity and activism. Symbolically, those Heritage Plaques must personify what Rob Ford dislikes about downtown Toronto: they tell suburban fellow-citizens, in so many words, that "we don't want your kind around here...stay on your own side of town..."
It's the same sentiment that stopped the DC Metro in Washington from being extended into Georgetown. And the same resistance stopped (temporarily) the building of the New York subway into the Upper East Side. Rob Ford may be on the verge of departing the political scene. But Toronto owes him a curious debt of gratitude for exposing the real divisions in this city. And whoever wins the office of mayor will face an enormous task.